Jean-Marie Deschamp was born in the Bonnières-on-Seine to 6 km from Giverny area favourable with the painters. I was born at Bonnieres-sur-Seine at 6km from Giverny. When I was 6, I went to Andelys, where Nicolas Poussin belonged. I remember the Van Gogh copies in the classroom. I started to draw and paint at those early years, and taught myself to it. As a teenager, I left to Africa. I did not know what I was looking for. 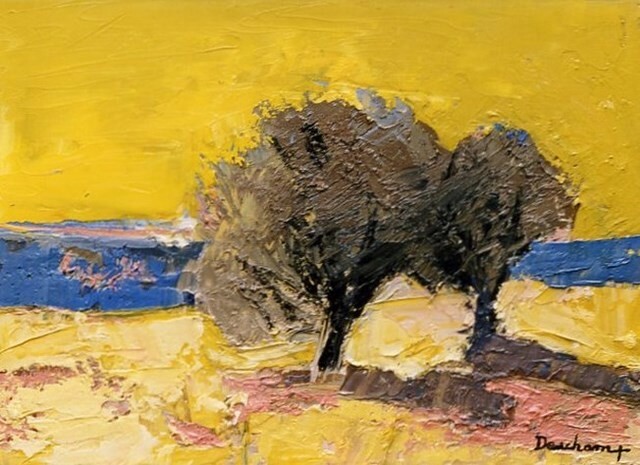 To eat and live, I painted and exposed my Art in Abijan and it is only in 1974 that I moved back to France and settled down in Carpentras, small town in Provence, located at the bottom of "the Giant of the South", the Mont Ventoux. There I met a small group of painters that regularly meet at the "Petit Montmartre", a bar where every artist can exhibit its art. There and through some hard times of my life, I discovered true friendships. Those helped me during the next seven years when I was torn away by a self destructing feeling. Painting saved my life and became my therapy. Throughout the years, my Art has shown a constant evolution. Even if sometimes I have been compared to one artist or another , this never stopped me to carry on further and become the independent sovereign of my work. Painting is to me a way to exorcised the hard times of my life. I hope my Art will evoke in you some emotions as those are to me more important than the words. Landscapes are a main part of my Art. With more or less creativity and realism but always showing a deep sense of perception to it. I always aspired to paint beautiful landscapes without really knowing what the meaning of "beautiful" is. Moving to Different places has allowed me to discover so much, coming from Normandy, I saw the first ray of light of the south of France in Toulon, while I was doing my service with the marines. In January 1969, while I had my first winter there, those lights appeared even more amazing. It is only later in life that I discovered other places such as the area Of Bordeaux, the Basque Country, Saint-Jean-of-Luz and Biarritz. My first important landscape works where inspired by the surroundings of Carpentras in Provence. Names such as the Legue, the cannal of Carpentras, the Throats of Nesque, Mormoiron, City-on-Auzon, Venasque, Saint-Didier, Beaumes of Venice, Vacqueyras, Gigondas, Aubignan, Malaucéne, Mazan, Crillon the Brave man, Caromb, Sault .st Gens maybe familiar to some. I discovered many of those places in company of the painters Dany and Martin Lartigue, also admirers of those warm and colourful areas, enhanced by the fresh smell of trees flouring and highlighted by the movement of butterflies. I have always worked on landscapes , working on the lights, the colours and the solid contact of the ground, on which every element rest.